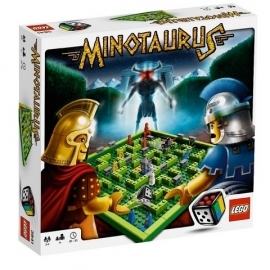 When I picked the game Minotaurus off the shelf at Walmart as a Christmas present for my son, it didn’t really cross my mind that this could be a great game for my gaming group the next time we have down time, but I sure am thinking that now. Fantasy game with a latin title - how can you go wrong? 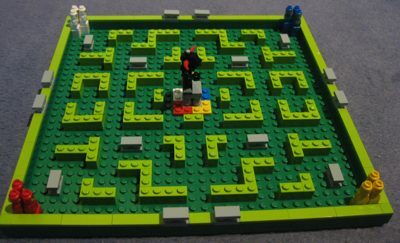 The game board is a labyrinth made of LEGO. Each player has three men who you are trying to get from your corner of the labyrinth to the center (the labyrinth is symetrical, for fairness). Complicating matters is that there is a minotaur running around the board, sending you back to your starting position, and that other players will at times rearrange the walls to your disadvantage. On your turn you roll a six sided die that has the numbers 3 through 6, plus a plain black side and a plain grey side. Rolling a number means you can move one of your men that many spaces. Rolling grey means that you can move one of the grey walls in the labrynth. Rolling black allows you to move the minotaur 8 spaces – sending home every man he touches along the way. The board set up as per instructions. I mean, if this game were any more customizable you would have to call it an rpg. I have already played the game a bunch of time, and despite the simple game play, am nowhere near being board of it. So if you want something for your group to on an off night, especially if you have lego sitting around, I highly recommend this game. Naturally the recommendation goes double if you have kids. Have an opinion about this article? I love comments. Please feel welcome to leave your thoughts. Either way, good review. Sounds like a good setup for parties or for travelling.